D. Castro Bookkeeping Services is an Ottawa area full service bookkeeping, accounting, payroll and tax service provider that focuses on small business and the non-profit sectors. The company focuses it's attention on listening to client needs, developing an accounting process that works for the client and yet meets or exceeds government and industry regulations. Dayani Castro founded the company to share her expertise in making bookkeeping and tax preparation processes customizable to the average business owner whose booking experience rangesf from very little to a lot. 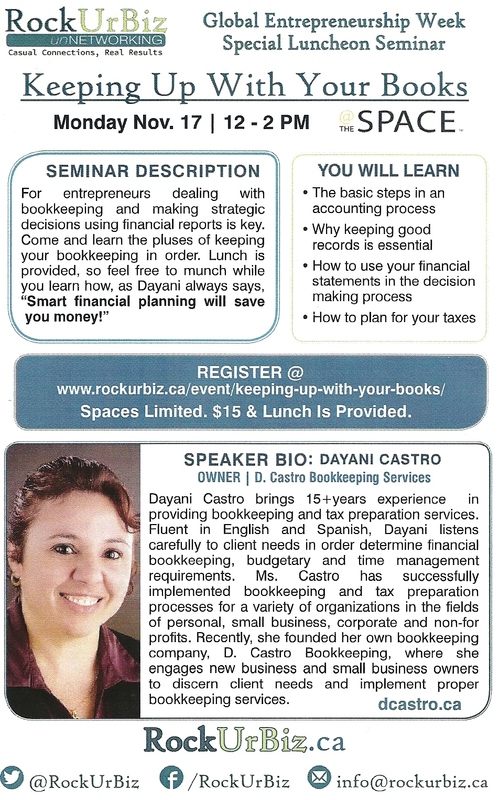 As part of promoting D. Castro Bookkeeping Services, Dayani provides bookkeeping courses that help introduce business owners to the needs of having a good set up financial records as well as some tips on how to do it. Dayani's next seminar is coming up on Monday November 17th Between 12 and 2 P.M. During the seminar, titled, "Keeping Up With Your Books" Dayani will be go over the basics steps in the accounting process, how to use financial statements to make decisions and how to plan for taxes. As part of advertising for this seminar Dayani needed personal and company biographies as well as a short description of her seminar. She turned to Suddcorp Solutions to craft just the right wording for her business and her seminar. Why Suddcorp Solutions? We had previously attended one her seminars in October and was able to highlight what business owners would find useful for their business. Suddcorp Solutions was able to help maximize the use of the personal and company biographies by crafting them in a such way that they could be used in other places online or in print to promote D. Castro Bookkeeping Services. Soon after the writing was completed and forwarded to the client the flyer for her seminar was printed. The wording on the flyer gives an easily digestible seminar description and a biography on why Dayani Castro can be considered an expert in her field. The seminar itself is an excellent opportunity to learn from an experienced bookkeeper who has successfully implemented accounting processes through her 15+ years in the field. The flyer for this seminar conveys this message loud and clear. Need help crafting content for your promotional materials? Have a business website, Linkedin profile or blog needing professional looking content? Suddcorp Solutions can help!